"The Thieves of Legend stole my breath with the sheer audacity of its storytelling, proving yet again that this series gets better with every installment. Bold, richly told, and rollicking with adventure, here is a thriller that demands to be read in one tension-wrought sitting. Count me a fan for life!" "The tension leaps off the pages in this classic, ticking-clock thriller. Watch out. You'll grip the pages so tight your knuckles will turn white." 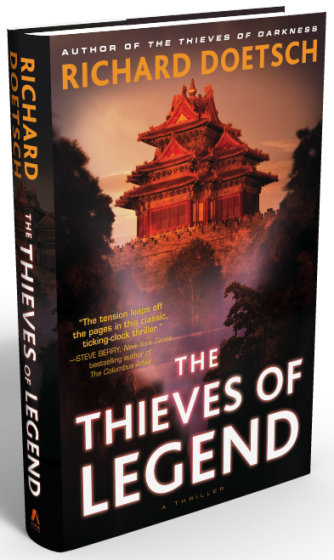 In a world of balance, in a world of dark and light, where East meets West, a horrific act propels former thief, Michael St. Pierre, hurtling into a mystery that began with the death of emperors and admirals upon palaces and ancient vessels five hundred years ago. Michael and his (just recently) ex-girlfriend KC Ryan are blackmailed by a U.S. Army colonel to travel to opposite ends of China, each responsible for stealing a piece of an ancient puzzle: a diary and the compass that will unlock the secret to one of history's greatest mysteries. With their lives depending on each other's success, they face off against the complex underworld of the Chinese triads, a twisted female assassin, and a madman whose only desire is to possess the secret held within the pages of the diary, a secret that would give him enormous power and lead to the downfall of nations. Moving from the glittering casinos of Macau to its dark and dangerous backstreets; from the palace at the heart of China's Forbidden City to the medieval castles of Spain; from the seaside mansions on the Amalfi Coast, to an uncharted pacific island where a cache of treasure conceals a long-lost secret, Michael is in a race against time for he has less than five days to uncover a five hundred year old mystery that is the key to saving KC from certain death. Click Above to Read The First Several Chapters!!! !